Sir Alexander Fleming FRS FRSE FRCS (6 August 1881 – 11 March 1955) was a Scottish biologist, pharmacologist and botanist. 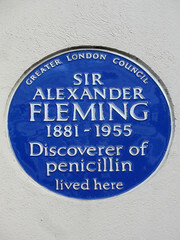 His best-known discoveries are the enzyme lysozyme in 1923 and the world's first antibiotic substance benzylpenicillin (Penicillin G) from the mould Penicillium notatum in 1928, for which he shared the Nobel Prize in Physiology or Medicine in 1945 with Howard Florey and Ernst Boris Chain. He wrote many articles on bacteriology, immunology, and chemotherapy. 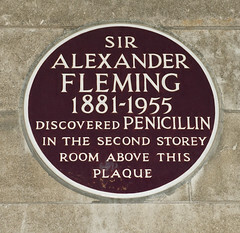 Fleming was knighted for his scientific achievements in 1944. Named in Time magazine's list of the 100 Most Important People of the 20th century, in 2002 he was named among the BBC's list of the 100 Greatest Britons.